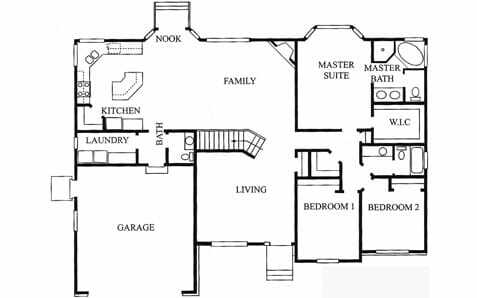 The Elm house plan has a total of 3,807 square feet, while the finished home has a floor area of 1,936 square feet. It features a spacious master suite with a walk-in closet and a full bath with a corner tub and a walk-in shower. The two smaller bedrooms are located in front of the master suite, right beside the shared full bath. This house plan has a formal living room that sits at the center of the design. At the back is the great room with an island kitchen, nook, and a family area with a corner fireplace. Beside the kitchen is a laundry room and lavatory. Picking out the details of this home design and constructing it will prove to be a smooth, seamless process with Perry Homes Utah. We’ve developed communities and built homes for over 40 years, and our company is committed to providing families with affordable homes with top-tier craftsmanship and construction materials. To make sure that your future home will fit your vision, we’ll assign you a design personnel who’ll walk you through every design option available to you. Our customer service team will also ensure that all your issues will be addressed promptly, even any post-construction concerns that you may find after you’ve moved in. Find out more about the Elm by getting in touch with Perry Homes. You may also check out our other home designs and communities to know more about our projects. Call us today at 801-264-8800 or send us a message through our Contact Us page, and let’s get started on building your dream Utah home as soon as possible.